What makes your store different, better or unique? Simple, secure & complete solution to manage Mobiles integrated with IMEI Numbers, serial numbers, and model numbers. 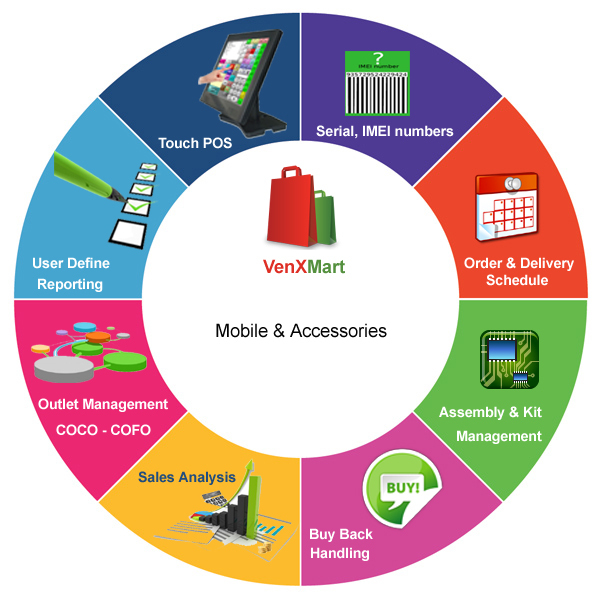 VenXMart is a perfect stock inventory solution for all categories of mobile and accessories. Solution loaded with unique IMEI number management, quick access of history details. It handles product age/type based sales staff incentive, rapid liquidation of non-moving stocks, calculation of accurate landing costs to fix margins etc. Serial number wise stock inventory and sale. Scan the IMEI number and do the sale bill. Shortcut formats are also available to avoid scanner. (i.e. manually you can enter IMEI number by typing “*2562” (last 4 digits) will pick up the IMEI number. History reports for items by entering serial number. Stock age calculation with serial numbers. Vendor returns with serial numbers for non moving items. Discount promotions can apply to particular serial number. The complete order management with commitment dates, assigned date, ready date and delivered date. Maximum number of commitments for day can be restricted. Daily order processing status report. Daily order delivering status report. Order status report whenever customer requires. Can raise the sale bill according to the order slip. Assemble multiple products as a Kit and assign the different barcode for that. (Kit Management). Buy a product as a kit and break it as independent components. Multi pack offers can declare. Stock inventory as a kit or independent components. Exchange offers can be automated. Stock inventory for old goods. Fast moving and slow moving items report. Profit analysis reports for top management. Inward and outward sales reports. Reports for whole sale and retail sales. Daily, monthly, yearly sale progress reports with charts. Sales man commission based sales reports. Branch or outlet wise sales reports. Sale with discount and sale against discount reports. Outlet wise hourly sales reports. Transfer of stock from warehouse to outlet/ branch can be done based on sales happened at the outlet. Outlet wise graphical representation of reports. Centralized stock transfers for outlets or franchises. Indent management for different outlets and analyze stock requirement. Stock dispatch alerts for different outlets. Stock Inward check at outlet level. Automated brand promotions at outlet level. Grouping, Filtering and searching are given to user level. Cross tab reporting formats given. Charts are given to represent the data graphically. Security management will apply on sensitive areas i.e., stock reports does not access to all users. Very User Friendly Touch POS Billing system. No need to use the keyboard. Beautifully designed touch screen content attract the operator and feel free to work. Its Colorful interface with your shop logo promotes your brand to customers. Images can be displayed for every item.